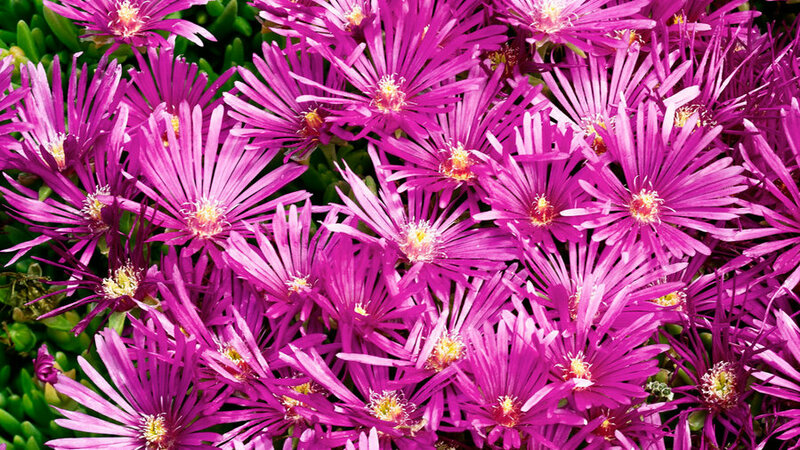 Some plants can slow a fire if they’re watered and pruned regularly like the ice plant (Delosperma): a ground­cover with succulent leaves and daisylike flowers of bright pink (D. cooperi) or yellow (D. nubigenum). Most ground covers require little attention beyond routine watering, mulching, fertilizing, and grooming. In many cases, maintenance takes very little time – especially when compared to the hours typically invested in lawn care. Ground covers, like any other plants, vary in their moisture needs, depending on the type and age of the plant. Soil texture and climate influence water needs as well. In general, however, most ground covers require regular water when young but may do very well with only occasional irrigation or with rainfall alone once they are mature and established. A hose-end sprinkler is often sufficient for applying water to small areas of ground cover. But for large areas or sloping sites that may be subject to erosion, you’ll find it more efficient to install a permanent watering system. Drip systems are well suited to ground covers. The kind of plant and the soil texture determine a ground cover’s need for fertilizer. As a rule of thumb, assume that woody, shrubby ground covers (especially drought-tolerant sorts) have fairly low nutrient needs and may get along with no additional fertilizer after planting. Perennial ground covers, with softer, lusher growth, generally have higher nutrient requirements and should receive an annual feeding. As far as soil goes, heavier (claylike) soils contain more nutrients and hold dissolved nutrients from fertilizers longer than do lighter, sandier ones – so ground covers in lighter soils are more likely to need periodic feeding. Ground covers that must compete with trees or shrubs often benefit from added fertilizer as well. It’s best to fertilize just before the growing season begins, so that nutrients are available for the year’s major growth push. Use a complete fertilizer in the amounts directed on the label. One of the primary reasons for planting a ground cover is to eliminate weeding. However, don’t expect to be freed from the job starting from the moment the plants are in the ground; until they fill in, some weeding is usually necessary. Getting rid of weeds before they set seed is important to prevent ongoing problems. Replenishing the mulch as it decomposes also aids in weed control. For serious weed problems, you may be able to use a selective herbicide – one that will kill weeds but not your ground cover. Read the label of any such product carefully to determine which weeds it kills and which ornamental plants it leaves unaffected. If not restricted, many ground covers will advance beyond the area you’ve allotted for them. If the plant spreads by underground stems or by rooting along stems that touch the soil, you may be able to control it by trimming the planting’s edges with pruning or hedge shears or with a rotary mower. But if growth is progressing significantly out of bounds, you may have to dig out the portions that have gone too far. Installing a permanent barrier of wood, brick, stone, or concrete will save you a great deal of hand edging. To keep persistent ground covers from creeping under the barrier, check the plant’s root depth and be sure the barrier extends deeper than that distance below ground. Some shrubby ground covers that are normally low growing may occasionally send out upright stems that spoil the evenness of the planting; cotoneaster is one example. When you see such stems, cut them back to their point of origin or to a horizontally growing lateral within the foliage mass. Woody ground covers – especially junipers and cotoneasters – are sometimes planted too close to paths, making frequent pruning necessary. Because constant cutting back usually ruins the shape of the plants, it’s often better simply to replace them with more suitable plants. Ground covers that root as they spread, as well as those that spread by underground stems to form dense patches, may eventually become so thick and matted that only mowing will restore their good looks. Plants like ivy (Hedera) accumulate thatch beneath the foliage; others, such as winter creeper (Euonymus) and Aaron’s beard (Hypericum), may become rangy and untidy. Mow these ground covers just before the start of the growing season, using a heavy-duty power mower set at 3 to 4 inches. Then fertilize to encourage rapid new growth.